During the winter season, citrus is abundant and this bright chicken salad is the perfect show stopper! Instead of the classic mayo coated chicken salad that sits in your stomach like a brick, this dressing is light and energizing with fresh orange juice, vinegar and olive oil. Not only is it healthful, it’s crazy versatile; add Citrus Chicken Salad to mixed greens, roll into a tortilla or fill a croissant and add a handful of arugula. Truly, you really can’t go wrong! Foodie Note: You can use pre-made Marcona Almonds, found in specialty shops and upscale grocery stores, instead of making your own. They are quite pricey (FYI). Also, if the weather is nice and it’s too hot to fire up the oven, use a pre-cooked rotisserie chicken. These are saltier than cooking your own, so don’t add salt to the dressing until you’ve tasted the final product. 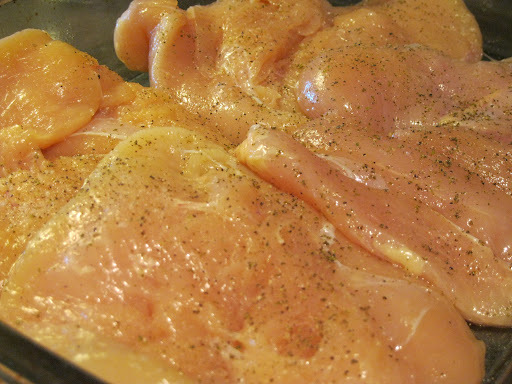 1) Preheat oven to 375*F. Prepare chicken: split breasts lengthwise (also called ‘butterflied’). A butcher can do this for you. Spread chicken open in greased baking dish, rub 1 tablespoon olive oil and 1/2 teaspoon salt/pepper into chicken (all sides). 2) Cover raw chicken with foil and bake in top third of oven for 15 minutes. Uncover, flip chicken breasts, bake on same rack for another 15 minutes. A thermometer should read 165*F; let rest in refrigerator while you make the almonds. 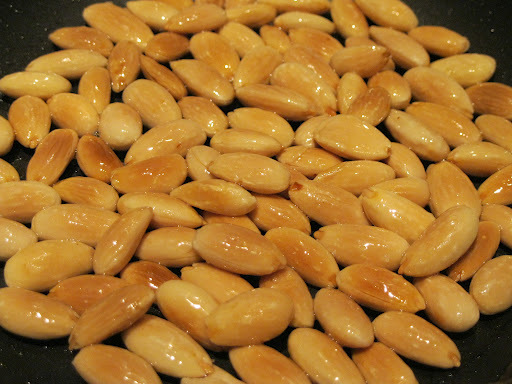 3) Prepare almonds: In a non-stick pan, heat oil to low-medium and add almonds. Cook about 7 minutes, stirring/tossing to brown. Sprinkle with 1/8 teaspoon kosher or sea salt. Let cool on a plate. 5) Mix dressing ingredients together. 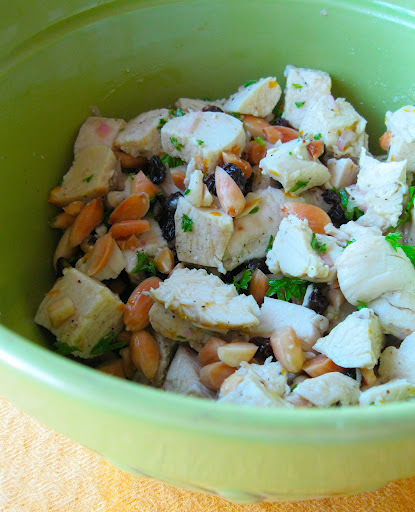 Cut cooled chicken into small 1/2″ chunks, add to a large bowl. 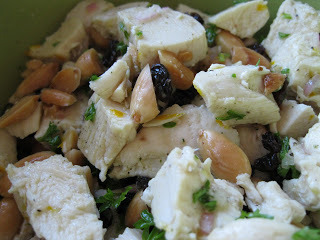 Add almonds, currents, celery, parsley and dressing. Toss together. Note: If you want to make in advance, add almonds right before serving so they are super crunchy. This salad marinates extremely well. Don’t be afraid to make enough to last a few days.